This month Edward J. Taylor continues his ongoing exploration of Deep Kyoto’s streets by strolling not one but two: Takeyacho and Ebisucho. The whisk of brooms has replaced the wail of sirens. Typhoon Jebi had roared through the day before, supposedly the strongest storm to hit Japan in 25 years. I could certainly believe it, the way that my old wooden house shook as if in fear. As I bicycled downtown to begin this walk today, I noticed large piles of branches and leaves in the wooden grounds of the temples and shrines along the way. The Imperial Palace grounds too had taken a pretty big hit, debris strewn haphazardly across the gravel seen through the gate. Shortly after the storm passed, my neighbors were out to assess the damage, and to right things that had blown over. And this morning was a symphony of brooms, the entire neighborhood in a coordinated waltz. Many of the brooms were made of bamboo, in keeping with a centuries-old tradition. The bamboo industry in Kyoto had always been centered around the eponymous Takeyamachi, where dozens of shops served both the Imperial Palace and the shogunal administrators at Nijō-jo. I had long wondered how many of the old shops remained, so set off as the remnants of yesterday’s winds continued their own dance. I start at Teramachi and walk west. The street is not a long one, and there is very little green remaining. Here and there are a few trees, and where there are trees there are leaves, a great many underfoot. As in my own neighborhood the older housewives are busy with their clean-up, wiping the dust from the grain of wooden screens and window frames. The street is pretty active, punctuated with people beginning their day. I am quickly finding that despite the street’s origins, it is today more residential, with very few businesses. One exception is an ancient looking tool shop, a cramped machiya currently used as a storehouse for recycled wooden planks. I’m nearing the end of the road soon, and quickly realizing that it is near devoid of any obvious remnants of history. 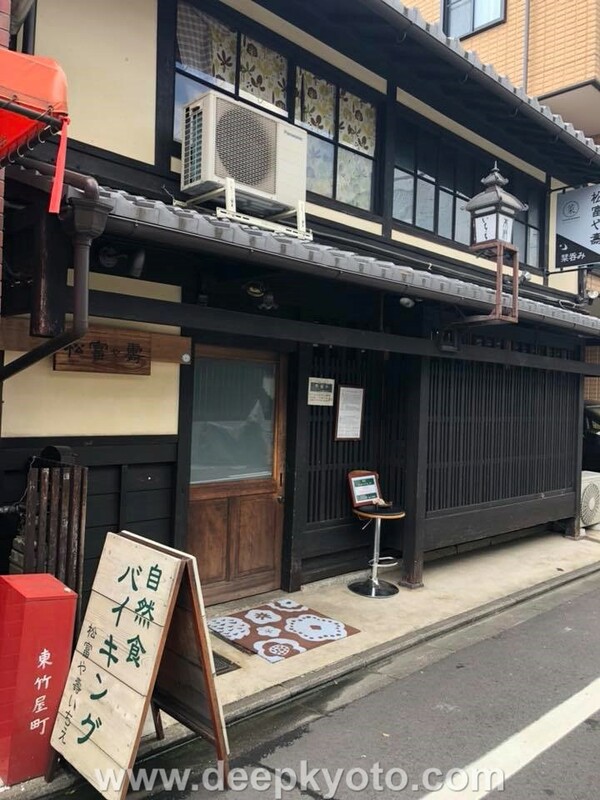 Perhaps the true history can be found instead in the realm of the personal, in this lively and very typical Kyoto residential neighborhood, where the old-timers laugh and chat as they sweep. I wonder where the centers of social interaction remain; perhaps at the small vegetable stand, or the tsukemono shop, or the store selling clothes that are decades beyond fashion. A couple of more modern restaurants appear a block or so from Horikawa. Most true to the vegetarian leanings of Deep Kyoto is Matsutomi ya Kotobuki, which serves up food in the traditional Kyoto Obanzai style, consisting of simple and seasonal vegetables. Nearby I also find one mystery. A barbershop has a sign announcing that for today at least, the shop is non-smoking. Next door, a pre-fabricated apartment building has lost its pre-fabricated tree out front. I cross the river, reminded that I missed its festival this year. Held every August according to the old lunar calendar, Horikawa’s Tanabata festival is a simple one, where people stroll at dusk amongst installations created by art students from Kyoto’s many universities. As night falls, a river of lights shines overhead, reflected by the slow moving stream beneath. It is perhaps my favorite date on Kyoto’s ample festival schedule, unpretentious, rarely crowded and enjoyed primarily by locals. Many of the latter no doubt occupy Takeyamachi’s final stretch, which is mainly squat blocks of flats. Tucked among them is a small Jizo for the raising of children. Near road’s end at Bifuku-dōri are a trio of impressive houses, one of which is the beautiful Guesthouse Nijo Fukuro-Tei, an example of a newer accommodation that reflects a true quiet dignity, one of Kyoto’s more impressive traits. These houses are lucky in that they have the green of Nijō-jo as their frontage. In the past Takeyamachi had been a much longer street, extending as far east as what is now known as Heian Jingu. But the area was completely obliviated in the Onin violence of the 15th century, then reshaped by Toyotomi Hideyoshi as a guild of bamboo craftsmen. And as I have found, very little of even that remains. 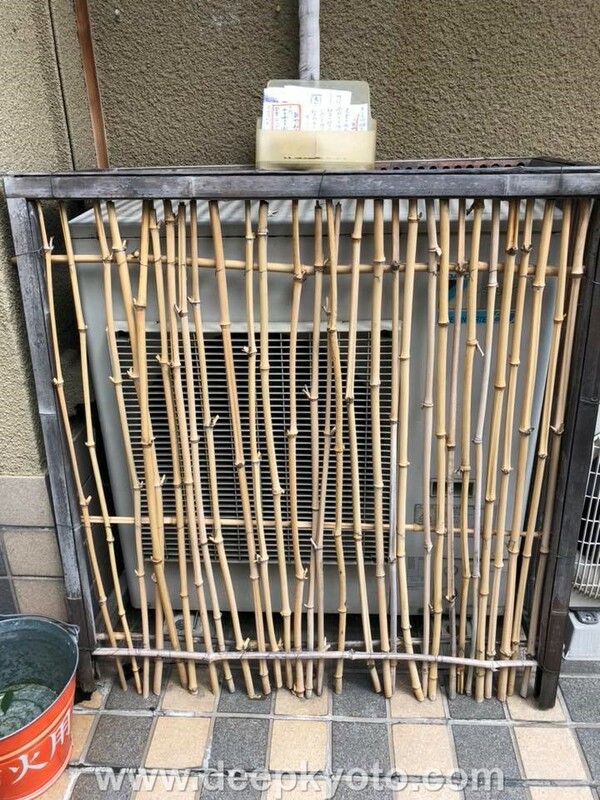 Nor much bamboo either, except for in the name of the Marutake meat market, or in a slim bit of fencing to hide the air conditioner at the posh looking eatery of Kanza. I am left feeling a bit unsatisfied, a feeling enhanced by the fact that the walk has taken me a mere half hour. 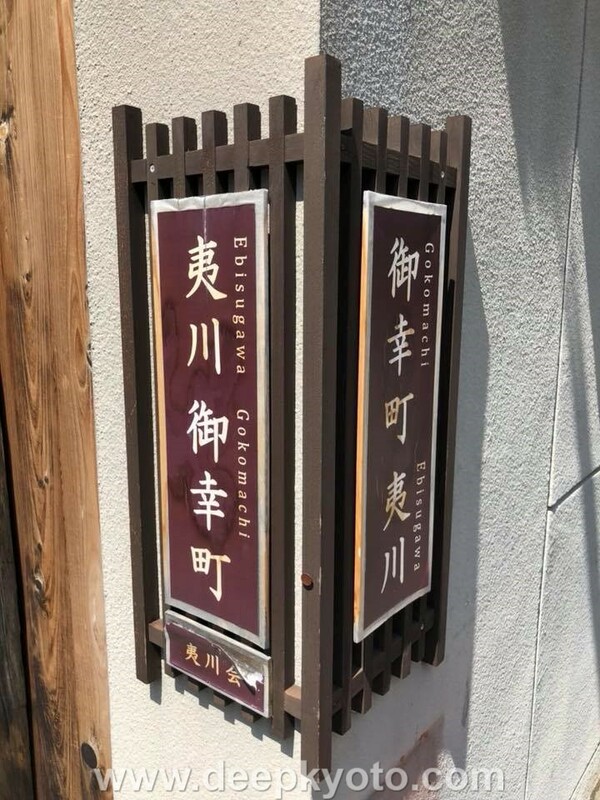 But a quick look at the map shows that another street of interest, Ebisugawa-cho, lies one block south, and will return me seamlessly to my bicycle. So I return to cross the Horikawa again, thinking how nice it is that all these little streets have their own bridges, all neatly lined up. 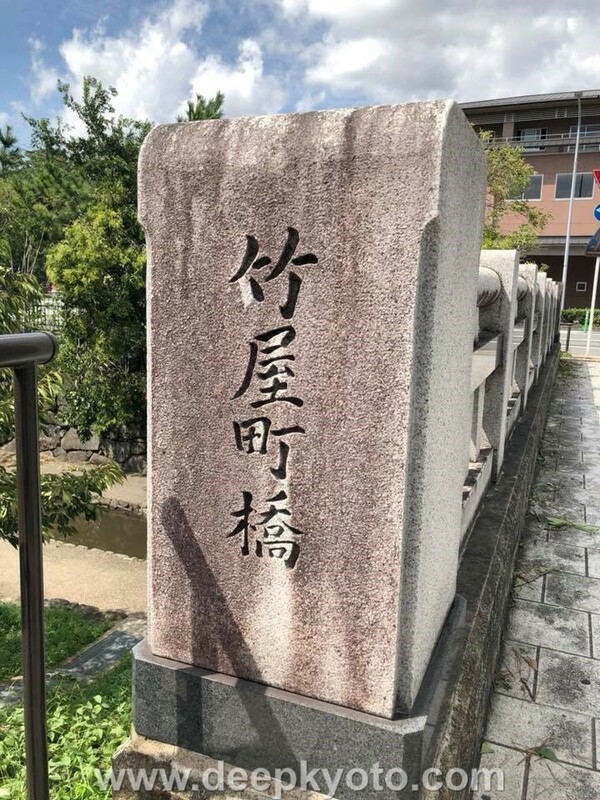 Ebisugawa once had a bridge over the Kamogawa as well, until it was taken out by a flood in 1935, living on as a series of stepping stones. Immediately, the street presents writing material. 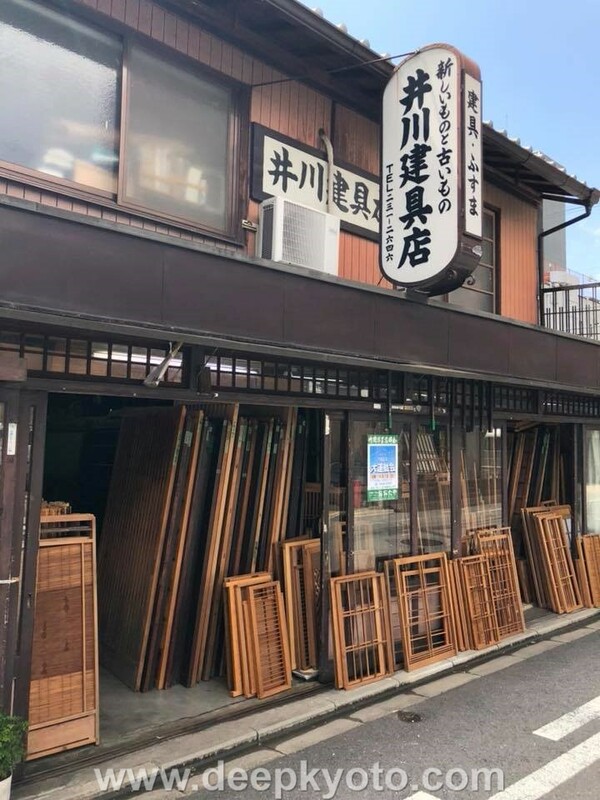 There are so many little ateliers, and workshops, and places selling furniture or other wooden materials, it is as if all the absent craftspeople on Takeyamachi have moved one block south. 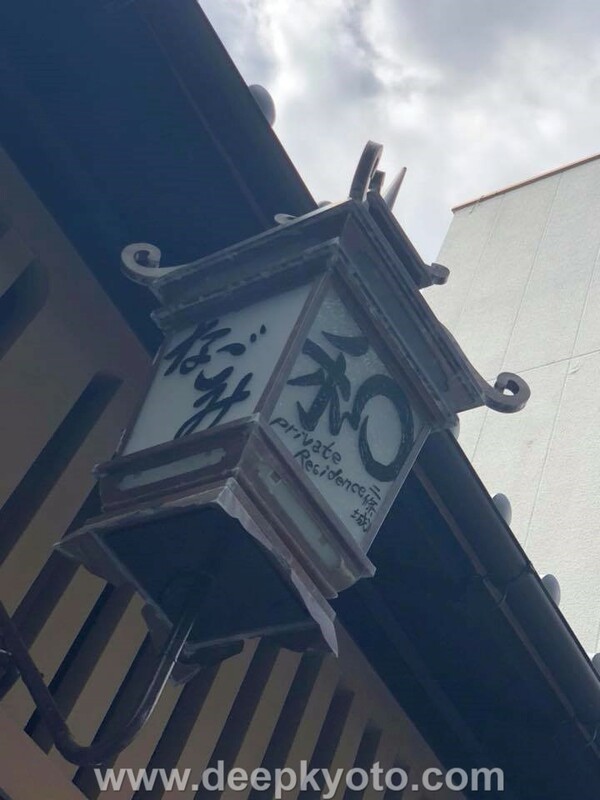 I find another mystery in noren curtains written with “Private Residence,” which looks to be an AirB&B kind of place, perhaps an ironic nod to the ubiquitous signs throughout Kyoto telling tourists what not to do, in numbers so great that it is quickly becoming a city trademark. An older trademark is Kyo-yasai, the local fresh vegetables that are a vital part of Kyoto cooking. This point is exemplified at Hitotsu no Osara (One Plate) café, which further impresses with its “Mama’s Menu.” A sign stating that they forbid smoking but do accept credit cards hints at foreign clientele. Perched on their rafters above is Ebisu himself, the Japanese god of fishermen and luck, who lent his name to the stream that once flowed along this stretch until Hideyoshi’s remodeling. 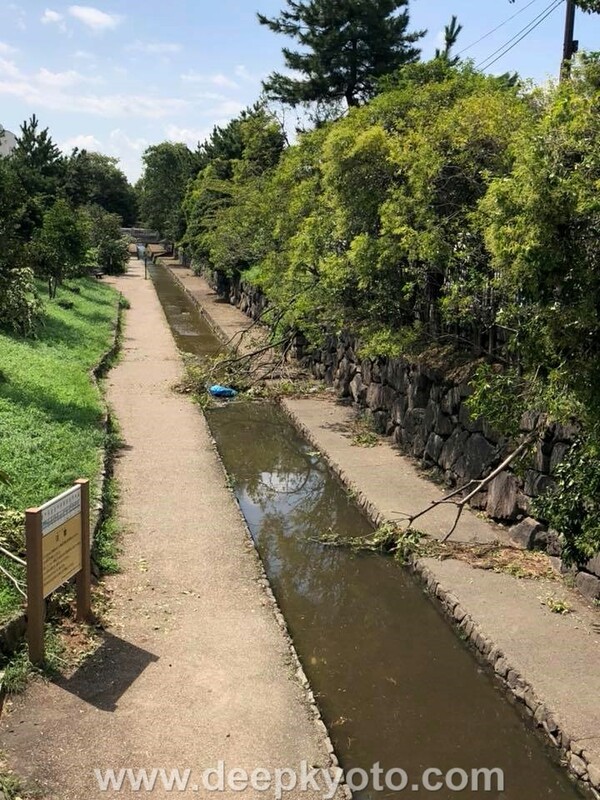 Dating to the Heian period, the street was formally known as Reizei-kōji, and a small section of the stream can still be seen at Ebisugawa-jido Park, which I’d passed minutes before. Ebisu’s name is repeated a block over, on an old faded sign for a long defunct men’s shop. 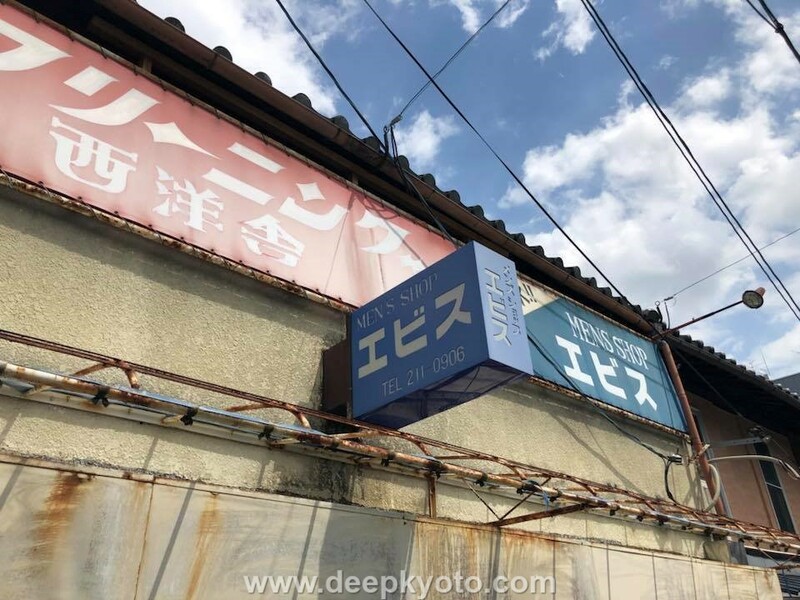 A few more relics of faded glory (the shuttered karaoke bar, a pair of tatami makers, an ancient coffee shop) hint that this had once been a prominent shopping arcade in its heyday. But there is life in the old street yet. In addition to a half dozen new-looking restaurants, this final block before Karasuma is also home to Art Stage 567, an event space converted from a rice shop in 2005. 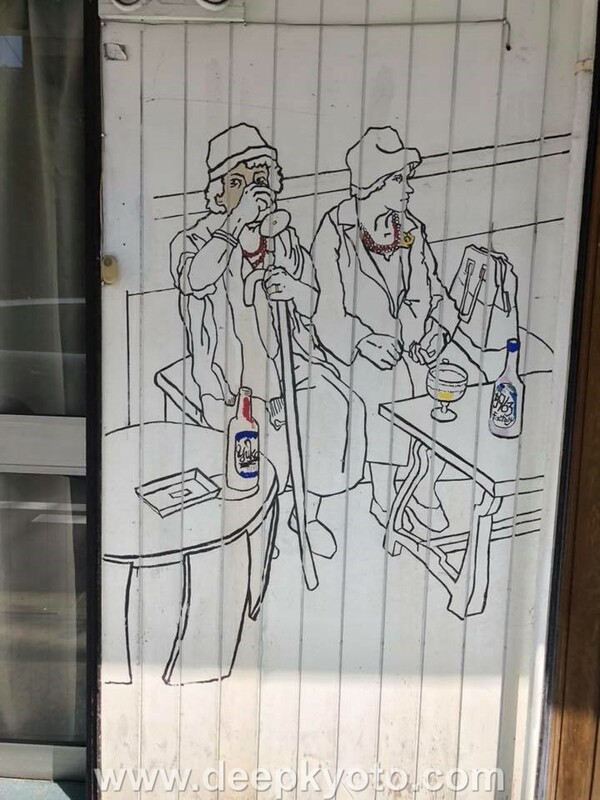 The old shop’s signage has been left on the frontage in a nod to this machiya’s 80-year old past. 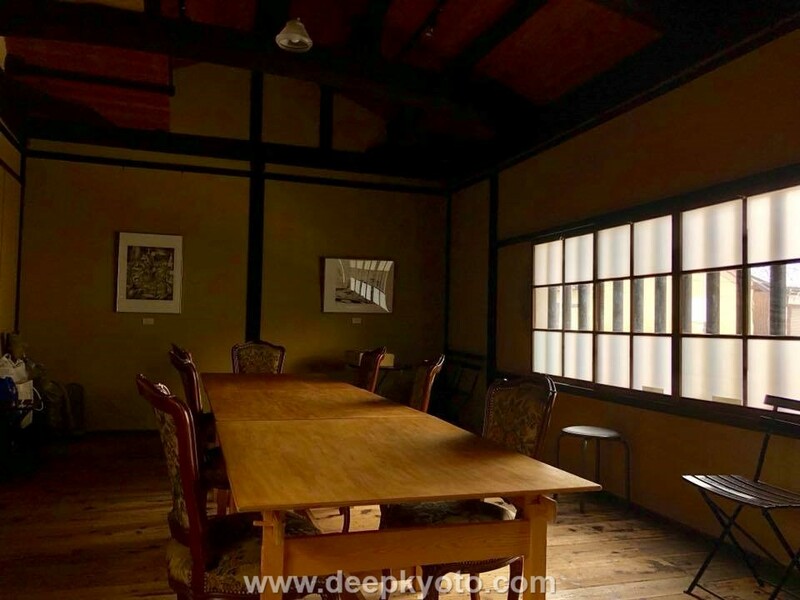 Restoring historical spaces is a mission of sorts for the owner, who has previously done so with an atelier founded in the early Showa period by renowned architect William Merrell Vories. She later became occupied with the restoration of noborikama pottery kilns. The ground floor of Art Stage 567 is filled with crafts and clothing created by local artists, while a large open space upstairs is used for workshops and intimate musical gatherings. Before I leave, the owner encourages me to attend the upcoming night of Tango music, which will undoubtedly get the place shaking even harder than it did during the typhoon. From Karasuma, Ebisugawa’s western end shows its tradition, especially this first block known colloquially as ‘furniture city.’ Ikawa presents the near infinite geometry of shoji screens and other wooden fittings used in classical Japanese interior design. Sadly an entire outer wall of the 75 year-old shop peeled away in yesterday’s typhoon, resting now in the adjacent carpark. Not far beyond, Kagude offers a more modern counterpoint, with modern furniture whose look has evolved a great deal since the company’s founding in 1883. With a slightly longer pedigree of 150 years, Miyazaki further along specializes in more orthodox Japanese furniture, as well as offering repair for the old. It also sponsors the adjacent Kyosashimono Museum, and its broad and impressive collection of antique furniture. More modest pieces can be found on the next block, lined near completely with antique shops. The oldest of which, Sakurai, has been in business since the 1870s. As a sort of counterpoint, the impressive Takagi Designs building is an elaborate montage of classical Indian and Greek mythology. In addition to recycling old themes, they also reuse old materials in a modern interpretation of wabi-sabi. My longest stop of the day is an impromptu one. Walking along, I catch a glimpse of a tall foreigner writing the day’s menu on a blackboard out front. We strike up a conversation, and in an ironic keeping with the day’s theme, Chez Luc is also in the process of converting tradition into the contemporary. 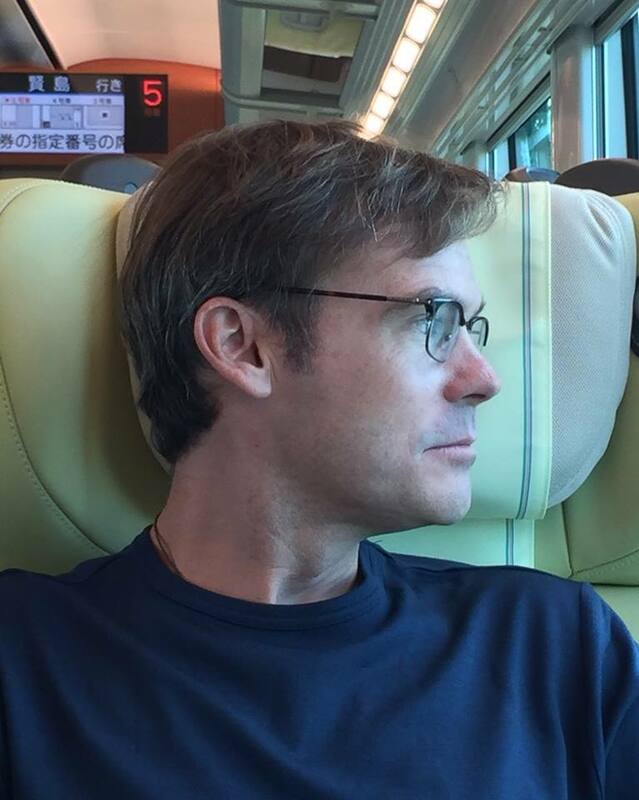 This native son of Strasbourg has been serving his native Alsatian cuisine out of this machiya bistro for the past decade, but from this very evening he will begin introducing local craft beers, to help support Shiga prefecture’s Two Rabbits Brewing Company, which just began brewing three months ago. Luc invites me in to try one of their Weizen, which goes down as well as it should after a long walk. And seeing his happy hour prices, I know my feet will happily find their way back here before too long. History does have a way of repeating itself.